This name isn’t surprising, for anyone who noticed that Mo Willems had two books in the Top 10 and four books in the Top 100. It is, however, astonishing. Mo is so young! And he beat DR. SEUSS! Oh, yes, for those just coming in, I am reporting the results by author from Betsy Bird’s Top 100 Picture Books Poll on her School Library Journal Fuse #8 blog. 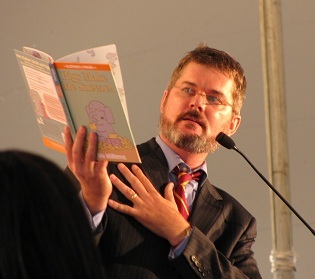 The #2 Picture Book Author and #2 Picture Book Illustrator was Mo Willems. Okay, I’m completely on the Mo Willems bandwagon. I’m convinced he’s a genius. You can tell, because I only review Picture Books that I especially like, and you can see below how many of his books I’ve chosen to review. Leonardo the Terrible Monster got four votes for a total of 19 points, and each voter commented. Owen Gray said, Mo Willems is a modern master of the picture book and this follow up to his classic Knuffle Bunny is a perfect example of his genius. Willems’ use of humor mixed with simple line work that conveys the emotion in the story more clearly than any words ever could makes this a great read aloud as well as one that can be enjoyed quietly. My favorite page is when the character Sam is introduced and only takes up one tiny corner of a blank, two-page spread. He looks so lonely and scared the audience immediately identifies with him. Balance that page against his two-page, giant-font tirade that nearly knocks Leonardo over and one can easily see how Mo Willems has a wide emotional spectrum as well as perfect comic timing at his command. Some say he’s the modern Dr. Seuss, but in truth he has carved out his own niche in the picture book realm. Aaron Zenz said, A main character with great personality. The use of space in the compositions is bold and brilliant. Flawless story beats and perfectly placed page turns. And Mark Flowers contributed, I doubt that Knuffle Bunny or the Pigeon needs my vote, but this one might. From the very first joke–Leonardo is a “terrible” monster because he can’t scare anyone–to its brilliant design, this book absolutely belongs among the top tier of Willem’s triumphs. City Dog, Country Frog, illustrated by Jon J. Muth, 19 points. Amy Miele aptly commented on this book, What an amazing book. When I first read about the subject matter of this book, I thought no way, its not going to work. I should have known better. Mo Willems can write about ANYTHING!! This book says so much about grief, and the phases of life. It proves along with Pink and Say that great literature can come in any form. Don’t Let the Pigeon Stay Up Late, one first place vote for 10 points. That voter, Sharon Thackston, commented, A tough choice between this and Drive the Bus, but this one is my favorite. It is arguably my favorite book to perform (and when I told Mr. Willems this at a book signing, he was delighted at my choice of the word “perform”). Stay Up Late trumps Drive the Bus for me, because of awesomely big pigeon yawn, followed by innocent eyes and “I was stretching.” Yeah-huh, Pigeon. Whatever you say. My Friend Is Sad got two votes for a total of 9 points, and both voters commented. Amy Miele said, Can I really just pick one elephant and piggie book? If I may only have one, this must be the one. I love the pathos (or is it bathos, I am never sure) in Gerald’s face after every appearance of Piggie. I love the expression in Piggie’s face at the end when she realizes that Gerald didn’t know that his best friend was trying desperately to cheer him. What I really love is Mo’s ability to convey so much with line drawings, and few words. WOW! To be blessed with that genius. And Sharon Thackston said, My favorite of the Elephant and Piggie early readers, because it’s a delight to perform. All of Piggie’s antics to cheer up Gerald, and all of Gerald’s hysteria in explaining his up and down day to Piggie are just priceless. Amy Weir said, Speaking of truly excellent easy readers. Reading these aloud is like putting on a play, and it’s wonderful to alternate parts with my beginning reader. Also, so, so funny. More pure genius. Stacy Dillon’s comment was short and sweet but right on: A game changer. Fun, fun, fun! The Duckling Gets a Cookie! ?, one fifth place vote for 6 points. I’m with that voter, Geraldine Farmer-Morrison, but hadn’t read the book yet when the poll happened. She commented, I did hesitate about putting this new title on the list, but this is my favorite of Willems’ books. I Am Invited to a Party got two votes for 5 points. Melissa Fox commented, Again, another easy reader that I’m sneaking in to a picture book list… But my girls adore this one. I think it was the Heavy Medal Newbery blog that mentioned Elephant and Piggie were like mini-plays, and I can attest to that; they are so much fun to read (over and over and over again) and it gets to the point where you can dual-read with your 3-year-old (trust me, I did!) each taking a “part”. It’s enormous amounts of fun. While they’re all fun, I Am Invited to a Party is our favorite. Hands down. WHAT? No one voted my favorite Elephant and Piggie book, Are You Ready to Play Outside?!? What is wrong with you people?! I admit, I wasted my vote on Don’t Let the Pigeon Drive the Bus, along with the crowd. But I seriously considered for this ONE book voting for two books by the same author. I admit, I enjoyed writing a blog piece on this book that included some musings about life lessons from the book. There you have it! Just compiling that list has worn me out. It’s easy to see why so many of us consider Mo Willems the new genius of the picture book form. This entry was posted on Monday, July 16th, 2012 at 10:39 pm and is filed under Top 100 Writers and Illustrators. You can follow any responses to this entry through the RSS 2.0 feed. You can leave a response, or trackback from your own site.